Celebrating 90 Years Of Life! 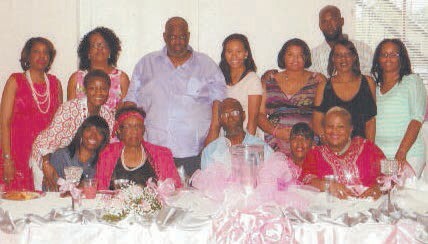 The family of Elonzia Mae Miller celebrated the journey of her 90th birthday Saturday, July 16 in the J.M. Benton Memorial Fellowship Hall. The celebration was hosted by her children, grandchildren, great-grand children and great-great grand children. Mrs. Miller was born July 11, 1926 in Mitchell County, Camilla, GA. Celebrating 90 years of life is a rare occasion, and more than 100 attendees gathered with the family to reflect on the past and thank God for his blessings as they celebrated the journey of the family matriarch. Attendees included family members Camilla, GA.
Mrs. Miller was blessed with seven children, 11 grandchildren, 16 greatgrand children, and three great-great-grandchildren. Mrs. Miller’s family believes the gift of long life is a blessing from God, and their prayer is for this 90th birthday to bring her invigorating dawns, long afternoons, exquisite sunsets, and brilliant full moons.